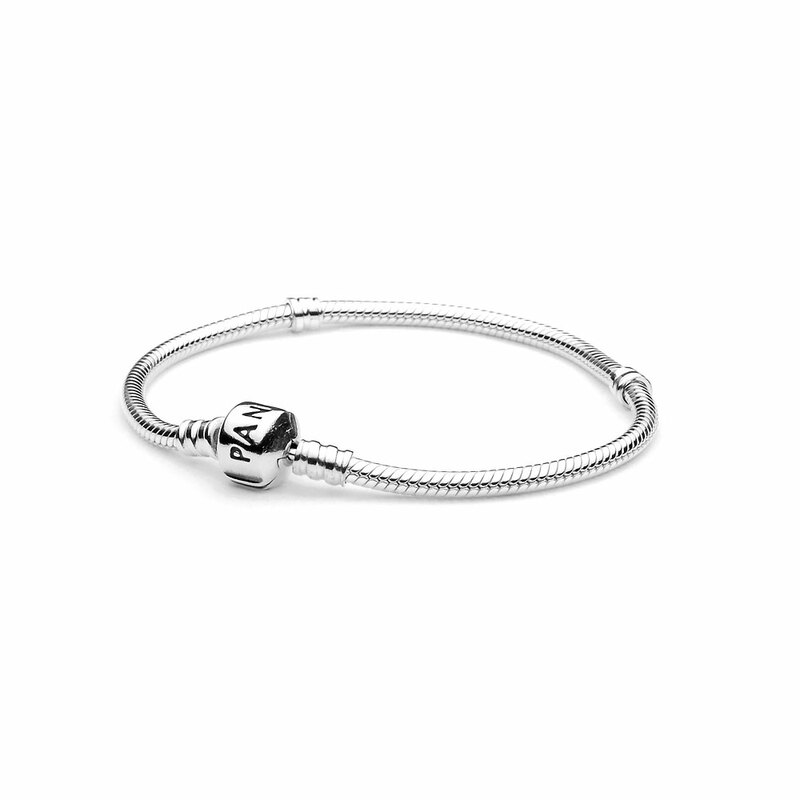 Start your PANDORA collection on this classic PANDORA silver charm bracelet with distinctive silver clasp. Available in 15, 16, 17, 18, 19, 20, 21 and 23cm. PANDORA Silver Bracelet with Silver Clasp is rated 4.8 out of 5 by 188. Rated 5 out of 5 by Taylor96 from 8 years strong! I was given this bracelet 8 years ago, as a gift for maintaining good grades throughout school. I’ve worn it consistently through this time and though it’s stretched a little, the bracelet is still in great condition, and holds a lot of sentiment! Rated 5 out of 5 by joyfuljay from perfect i’ve taken all my charms off this bracelet and placed them on a bangle.. this bracelet is one of the best ones you can pick although it might pull on your at hairs, it goes with everything and it’s one of a kind.. forgot to mention this item DOES stretch a lot overtime from the weight of charms so i purchased this a bit smaller than my normal size. Rated 5 out of 5 by Nikki P from Classy, timeless gift I bought this for my mom for Mother's Day along with a Mother & Friend heart charm and she loved it! The bracelet goes with everything and selecting and collecting charms is now a shared, treasured experience. Highly recommended. Rated 5 out of 5 by Jdeg from Braclet and ring. Being so unorganised. 3 days before my sisters 21, I still hadn't gotten her a present. Ordered on Wednesday and here Friday! Couldn't ask for a better service! Happy customer, happy sister. Rated 5 out of 5 by ShaunaBanana94 from Cute Love it! Bought it for my mom for mother's day. Seems stiff when you just purchase it but after a few wears it seems to loosen up. Rated 5 out of 5 by Briana5450 from LOVE This is one of my favorite and does NOT come off for any reason! I ride horses and am very hard on most of my jewelry and this has held up very nice! Rated 5 out of 5 by Tyrra from I love my Pandora and can’t wait to add my charms. I bought this as a Birthday gift to myself. I wish Pandora offered more discounts!! !